New Waterfall loudspeakers at last! 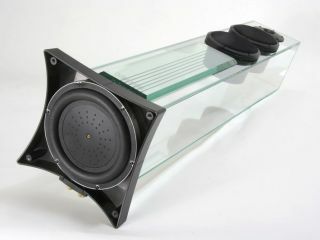 When Waterfall loudspeakers arrived on the hi-fi scene some eight years ago, its glass loudspeakers were a revelation. Now, after a considerable wait, the French specialist has launched new versions of its existing models. The well established Iguasçu and Victoria speakers have been replaced with EVO versions - the two-way Iguasçu EVO and three-way Victoria EVO. The new models are said to have increased power handling, low distortion and "remarkable" low frequency extension. This is, in part, due to a tie-up with driver manufacturer Atohm, which has supplied a new generation of aluminium drive units to the French company. The new driver complement, seen in both models, includes the tweeter, midrange driver and bass unit. Key to both models is the downward-firing bass driver: a new 210mm unit (named the UFR 210) integrated into the plinth of each speaker. It's clever positioning undoubtedly adds to Waterfall's claims of enhanced bass extension from the EVO models. According to a Waterfall spokesperson, all mechanical parts in the speakers are manufactured from die-cast aluminium and for the first time, the speakers are available with grilles. The sensitivity of each model is rated at an average 88db (Iguasçu EVO) and 89db (Victoria EVO). Both EVO models are available now.